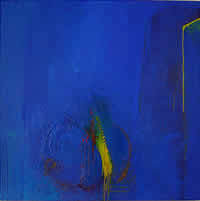 Regi Bar David is one of South Africa’s few painters who has stuck with the genre of abstraction for many years. The inspiration and passion that she manifests in her work demonstrates her sincerity in her conviction, which offers the work integrity and justifies the critical and commercial successes it has garnered through the years. Regi is inspired by the challenge of creating something out of nothing, the unpredictability of the medium and the thrill of pushing and pulling her medium to make this happen. “My work offers me the freedom to be myself without social conditioning,” she says. 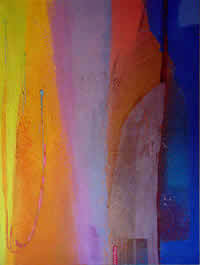 “In it, I search for something bigger and more meaningful than myself.” In grappling with colour, line, tone, textures and the complex sensations they evoke for her, Regi is always surprised as images begin to appear out of the pouring, scratching, drawing, a methodology she uses based on gut instinct and passion. The layering of thought and possibility in Regi’s work blend a deep realization of spiritual evocations and physical existence, much of which is not on an articulate level, but operates with intuitive response. She refers to the experience of one-ness with her colour as symphonic, and understands the thrill of blending possibilities and thus creating new, kaleidoscopic ones, as overwhelmingly exciting and addictive. “It’s the ultimate experience”, she says, referring to the ineffable which can be attained only occasionally and fleetingly in music or scent, in food or memories. The realization that a work is complete is beyond verbal explanation, but the sense of closure and beauty calms an inner sensibility within her.